Lakeview room with one queen bed. All rooms are non-smoking and pet free. Check-in is from 3:00 p.m. until 10:00 p.m. If you will arrive later than 10:00 p.m., please call us to arrange an after hours check-in. Cancellations: If you will not be able to keep your reservation, you must call to cancel. Please give us as much advance notice of cancellation as possible. There is no charge for a cancelled reservation if you provide the required advance notice. If your reservation is for a motel room without kitchen facilities, you must provide at least 24 hours notice of cancellation. If your reservation is for a kitchenette suite, the cottage, or the loft apartment, you must provide one week's notice. If you do not provide the required notice, you will be charged for one night plus tax. 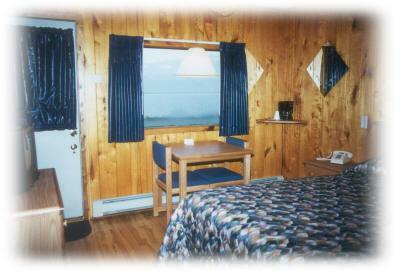 We are located eight miles northeast of Grand Marais on Highway 61, about half way between mile markers 118 and 119.